Calleigh came to us last September the Monday morning after the Precious Secrets Sheltie Rescue annual picnic, and how it happened was very mysterious. We had worked the registration table at the picnic since we didn’t have any dogs to care for; we had lost both of our shelties to illness in the previous few months. As each sheltie alumnus came through the gate, we realized how much we missed having a fluffy, sweet sheltie in our lives. We decided it was time to find one. We talked with Pam, the shelter owner and she said she had heard of a young sheltie that needed to be placed and she would follow up on it later. But, the very next morning, early, our phone rang and it was our neighbor who said there was a seven month old sheltie she knew of who was being sent to the SPCA that very day, because her family lost their home and couldn’t keep her any longer. Of course we had to take her. We were sorry about the other sheltie Pam had heard of, but this one needed us more. Of course, in the end it turned out that Calleigh was the very same sheltie Pam had heard of also, so it was definitely meant to be that she became part of our family. First stop for Calleigh was a visit to Dr. Wolf, and he found her to be healthy and ready for adoption. 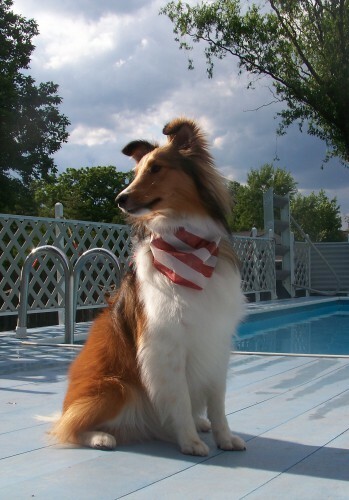 We usually adopt older shelties, rescue dogs; one was even 12 years old when we took her into our family. It’s been a long time since we adopted such a young dog. Calleigh has been challenging at times because she is so high energy, but she is very intelligent and obedient. She loves to play with other dogs and especially to be chased at the dog park. If you have a dog who loves to run, play, and chase other dogs, please contact us for a play date with Calleigh! We are happy that Miss Calleigh won the Pet of the Month for July for the Mason Animal Hospital. We love the staff, and all of our pets get amazing care at MAH. We appreciate everything they do to keep our all of our pets happy and healthy!